Get him to work in Government! Rob Anderson, 39, said the winning ticket was a misprint that he decided to keep while buying stocking stuffers at a Georgetown, Ky., gas station. He wanted to buy $1 lottery tickets for three people, but the clerk goofed. "The clerk ran the $3 Quick Pick but he put it all on one ticket, and I was like, doggone it, I needed three separate tickets," Anderson said. The clerk asked him if he wanted to keep the ticket, which had three sets of random numbers. "Yeah, I got a couple extra dollars," Anderson said, and he bought three more tickets to give as gifts. When he arrived at home, he tossed the ticket on his dresser and didn't think about it until the Sunday morning after the drawing. 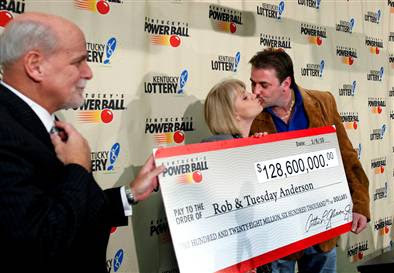 When he remembered it, he checked the Powerball numbers and they matched one of the sets of numbers on the botched ticket: 32-36-37-41-53 and Powerball 30.